Twitter chats have been around for years, but they seem to be increasing with industries like pharmaceutical, education, marketing and new business efforts. For example, see all these chats in the pharma industry. I thought laying down some of the rules and tools for Twitter Chats would be a good start for those just thinking about starting a chat. To begin you should know that twitter chats are great engagement and highly targeted to your audience. So what is a Twitter Chat? Twitter chats are public Twitter conversations that take place surrounding a specific hashtag at a predetermined date and time. The hashtag often provides some context for the topic or theme of the chat, and allows people to easily find the conversation and participate. Most often, Twitter chats are not one-off discussions, but rather recurring events. Participate in a chat before hosting your own. Choose the right topic for your audience. Find the right date and time. A hashtag chat is a way of organizing a conversation so that anyone on Twitter can follow, join, and contribute. It centers around a single hashtag, often including the word “chat”, that usually denotes the broad topic of conversation. Hashtag chats are pre-organized and occur at the same time every day, week or month..
Do your research to find something unique. Keep it short and sweet.. Invite relevant influencers and community members to participate. Chats can be very active, with a lot of people participating and a lot of new tweets coming in every moment, so there is a great chance you will miss something important and become frustrated after at first. Luckily, there are tools you can use to make this process easier and much more enjoyable. TweetChat is where the world comes to chat. A Twitter chat platform which allows users to participate in real-time hashtag conversations, visit and share their comments. To make things run as smoothly as possible, you can filter a Twitter chat conversation by hashtag from the aptly named TweetChat. It also provides an easy-to-use share button that allows anyone to promote the chat from within the app. Other major benefits include the ability to pause Tweets or choose the speed that new posts head your way, so you have a chance to read and reply. The minimum interval is five seconds, which for some Twitter users might be a slow in terms of updating Tweets. Tchat.io is a web service that makes it incredibly easy to participate in Twitter chats. You simply enter a hashtag that you want to follow and the tool will instantly load all the tweets with that hashtag. Tchat will update the stream with new tweets in real-time. You can pause the stream whenever you like, hide retweets, or switch between hashtags if you are following more than one topic. Although Hootsuite is a very robust social media management tool, it’s also widely used to keep up with Twitter chats. It streams Tweets from chats to allow hosts to effectively moderate the conversation. Simply add a stream, search for the hashtag you want to track and join the conversation. You can add multiple streams, meaning you can track various Twitter chats along with your Tweets, scheduled posts, mentions, direct messages, and much more. In addition, Hootsuite offers some great internal collaboration features, allowing you to assign Tweets to different team members and start internal chats regarding any particular tweet. Up to 3 social profiles, you can benefit from Hootsuite’s free version. TweetDeck is one of the most popular free Twitter management tools because of its ability to add extra columns to target and customize streams of Tweets, making it easy to filter and keep up with lots of Twitter conversations. A good setup in TweetDeck could be one column for @mentions of your Twitter account, two columns for the hashtag (one to watch the stream, and one toe pause/scroll through specific tweets), one user column to see the Tweets you’ve put out and one column to follow the Tweets of the chat moderator to help you keep up with the questions. Other benefits of TweetDeck include managing multiple Twitter accounts and the ability to synchronize your configuration when you use TweetDeck on different computers and mobile devices. Getting involved in Twitter chats is a great way to attract new followers and actively participate in relevant conversations with peers from your niche or industry. You can use any of the above tools to start leveraging the benefits of Twitter chats for your clients or yourself. Just get involved in a few chats and you’ll pick up on what to do. If you have ever wondered how effective your engagement is doing on Twitter, I have some tools for you to check out. And if you’re running campaigns or researching on Twitter there are some phenomenal FREE tools. And wrapping that all up for a report to your client is vital. First off, if you want to look at just your account, the analytics that comes with Twitter is very informative. But make sure you have it turned on. Here is a link on how to activate your analytics and see your engagement activity. Twitter Reach can help identify influencers on Twitter through their tweets associated with a keyword and how much they influence. It’s quite useful for checking in on mentions of your Twitter username and tracking branded hashtags and industry keywords. Dig deeper into Twitter analytics: Who are your followers? Where are they located? When do they tweet? Find and connect with new influencers in your niche. Use super-actionable visualizations to compare your social graph to others. The last free tool to show you is a tool called Keyhole. Keyhole is a social media monitoring and campaign tracking service with a real-time, visual dashboard. It offers monitoring for Twitter, Facebook and Instagram- of hashtags, URLs and keywords. It provides insights such as demographics, location and topic clouds that can be used for identifying influencers. For hashtag and keyword tracking, it provides a wealth of information such as reach, top posts, share of posts, and more. For account tracking, you can monitor your brand’s or competitor’s engagement on Twitter, Instagram, or Facebook. A social media report is simply a collection of data and stats. But sometimes you can find yourself in “analysis paralysis'” meaning to much data. And then you need to explain int in a relevant way to your client. Which data and stats should be on there? And why? Here is a good place to start. The answer likely depends on your specific social media strategies and goals. Followers tell you the number of people who wish to connect with your brand. The benefits of followers are for the reach of your content, the social proof of your brand’s popularity, and in some cases a simple vanity metric to boost your confidence! Clicks tell you that the content you’re sharing is of personal interest to the user. Clicks send traffic to a URL and establish your social profile as a great resource for curated content. Retweets tell you that the content you’re sharing is perceived as potentially interesting to one’s followers. The benefits of retweets is for advanced exposure to people who aren’t your followers and social proof that you know what you’re doing on social media. Favorites are somewhat of a wild card. The benefit of favorites is as a social proof metric, and beyond that, it’s a bit hard to tell what people are thinking when they favorite because there are so many different strategies and reasons (curation, appreciation, bookmarking, etc.). On some channels, favorites/likes may surface the content higher into the News Feed. But you can do less and more points of contact based on your strategy. The other factors to producing a solid report is choosing a timeframe and presenting “what good looks like” vs your brand. Which timeframe is most valuable to you? Here is one way to display your social media stats. Here is another dashboard example and you can download a template from their website. As more and more social media networks emerge, they don’t simply launch and hope for the most visitors. They need to be targeted and fill an unmet need with their audience. Ongoing engagement has never been more important in order to keep users coming back. The biggest differentiators are gender and age. Coupled with those 2 factors, is the technology behind the social tool. Is the Social App easy to use? Does it have a evident need to exist for that gender or age group? For example, Snapchat is popular with millennials because it is “instant,” and teens are instant. Also, because the App requires a little more tech savvy, a 50 yr old may not want to invest the time to learn – I’m the exception 🙂 . Pinterest has tremendous reach among women. Among US female internet users, 42% reported being on Pinterest in Pew’s late-2014 survey, compared to only 13% of men. Instagram has become the most important and most-used social network for US teens. 32% of US teenagers cited it as their most important social network, compared to only 14% saying that of Facebook. Snapchat, Vine, and Tumblr had by far the most youthful user bases of the social networks we looked at. 45% of Snapchat’s adult users are between 18 and 24, followed by Vine (28%) and Tumblr (28%), according to comScore. LinkedIn enjoys high adoption among highly educated and high-income users. LinkedIn is used by 44% of Americans with income of $75,000 or more, according to Pew. Messaging apps also have become more broadly popular, but still skew young: 7% of all people in the US aged 12 and older use WhatsApp, according to the Edison Research and Triton Digital survey. The aging of Facebook, Twitter, LinkedIn, and even Pinterest is more apparent than ever. That’s especially true of Facebook: Less than two-fifths of Facebook’s adult user base in the US is aged 18 to 34, according to comScore. In the US, while gender, income, and education have little impact on whether or not someone uses social media, these factors do have a big impact on which social networks people opt to use. Many top social networks – including Facebook, Pinterest, and Instagram – have a strong skew toward female users. Women in the US are more likely to use Facebook than men by about 11%, Pinterest by 29%, and Instagram by 7%, according to Pew. But Twitter and LinkedIn continue to attract a mostly male audience. There are more channels to compete with social media that would take males away from Facebook and Pinterest, like YouTube or Reddit. While this isn’t considered social media, at the end of the day, it’s the content that draws peoples attention, not necessarily the platform. 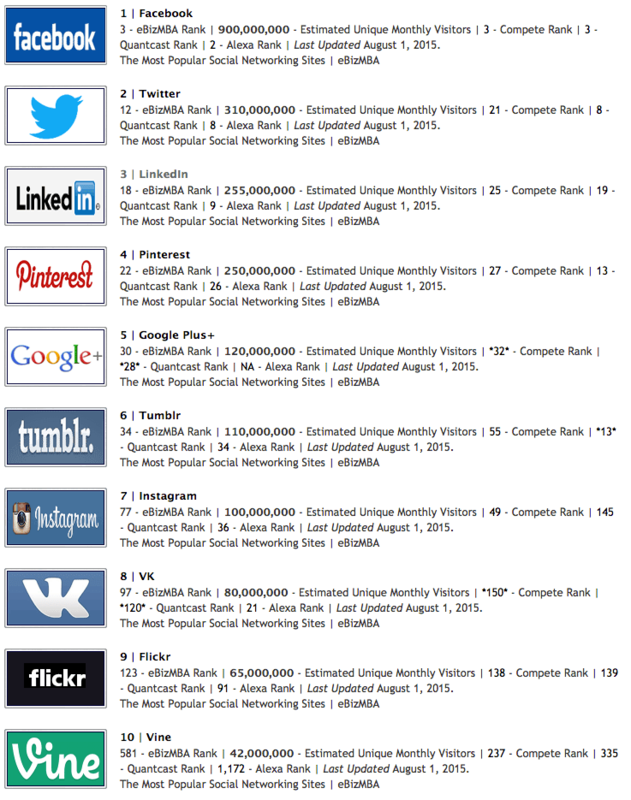 Top 10 Most Popular Social Networking Sites as derived from our eBizMBA Rank which is a continually updated average of each website’s Alexa Global Traffic Rank, and U.S. Traffic Rank from both Compete and Quantcast. Is Social Media a drug? Watch video to find out. Good Engagement Between TV and Twitter? What is the engagement level between TV and Twitter? No doubt these 2 are closely connected these days. These 2 platforms were made for each other, yet neither relies on the other to deliver content. But combined, it is a 2 way conversation made in heaven. It’s instant response that is still undervalued. Live commenting during the shows has grown in popularity over the past few years. I’m surprised this marriage has not spawned a more engaging tool. All in all, the engagement and interest levels are rising between these two. A recent study by Nielsen says that at least 15% of TV viewers enjoy TV more “when social media is involved.” They’re also, Nielsen notes, still watching live TV. Adults (18 and over) watch over five hours of live TV per day. And when we watch live TV we use social media to engage, react and discuss. On Twitter, we follow these interactions with hashtags. For example, if you wanted to keep track of all the conversation revolving around the Academy Awards ceremony, you used #Oscar2015 in your tweets and watched for tweets containing that hashtag. The real savvy Twitter users employ Twitter dashboards to track all the activity revolving around these hashtags. Tools like TweetDeck and Hootsuite and put all related tweets in a single column, while leaving your other columns like, notifications, and your general Twitter stream separated. Where does all this fall out with audience participation? 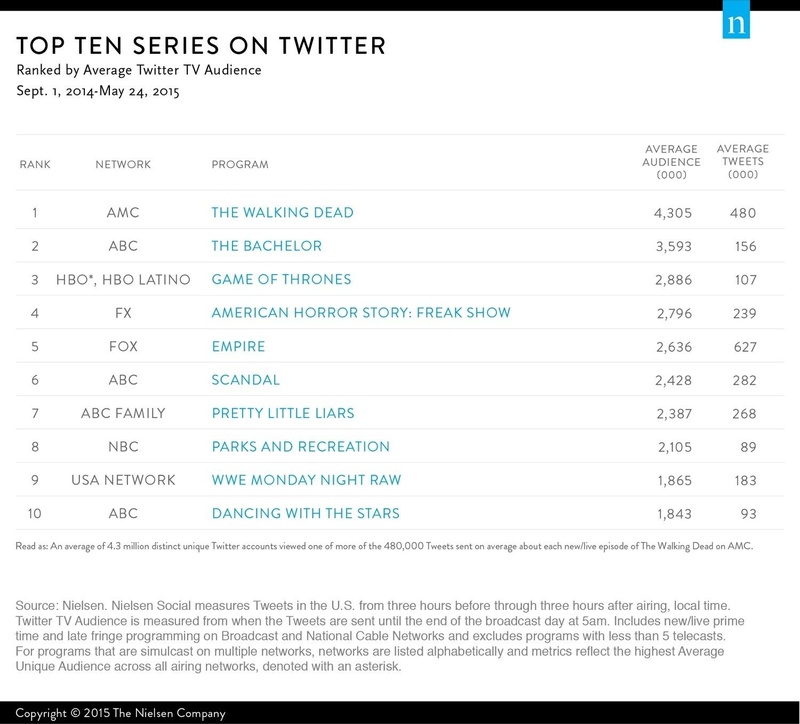 Here are some Twitter facts about audiences and engagement from Nielsen. 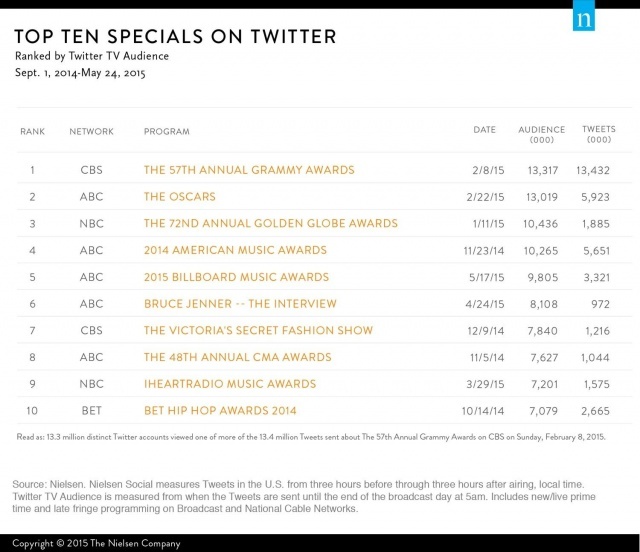 There were a total of 3.3 billion impressions of Oscars-related tweets. 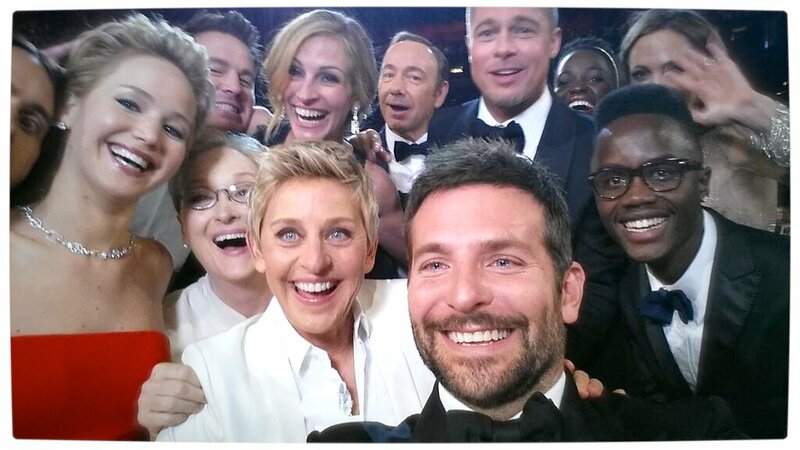 19.1 million Oscar-related tweets were posted. The tweets were sent by more than 5 million people. More than 37 million people viewed these tweets across Twitter.com and Twitter’s mobile and desktop applications. That’s nearly as many as the 43 million people who watched the show. 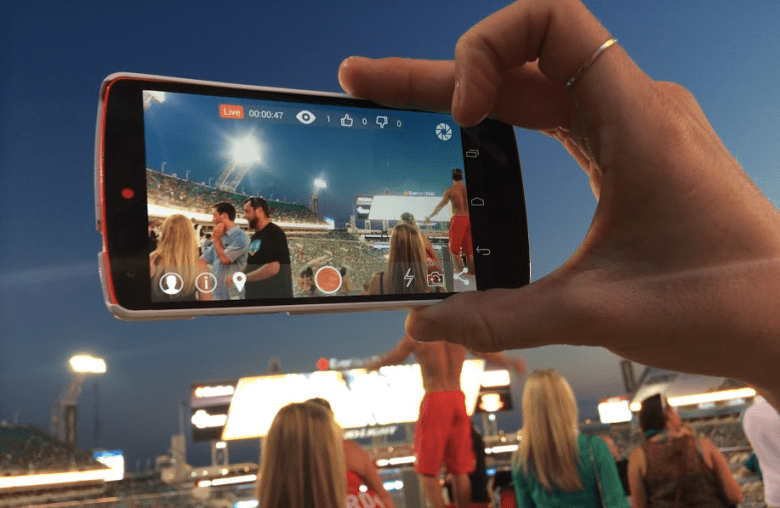 If you haven’t experienced “Live Streaming” with Meerkat yet, you’re not alone. That is because it is still in its infancy stage. Meerkat made its debut at SXSW this year and received a lot of attention. The live streams that are being posted aren’t exactly exciting yet – mine included. But I’m telling you the thought behind this idea is fascinating. It is what Facebook was to social media. Here is why I think so. With the Meerkat app loaded on your device you can tweet a live event to people who also have the Meerkat app, and want to join in and watch. 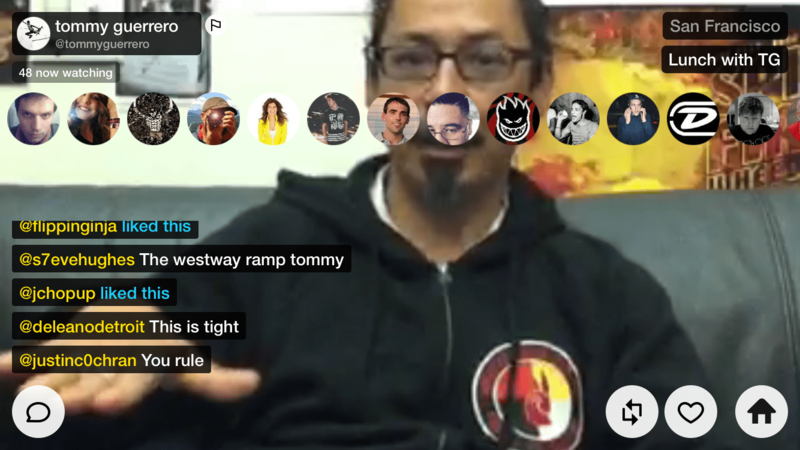 When you join in you can see other folks that are watching and chat about the situation. Imagine live demonstrations or news that is happening at the moment. 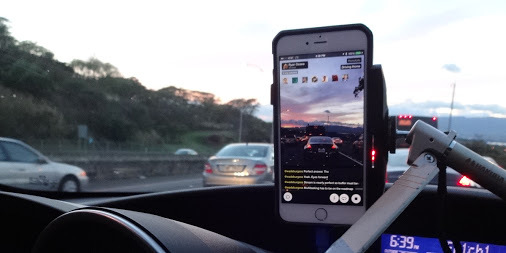 Impact of the Meerkat App. The best way to explain Meerkat is to think of all the situations where this would be applicable. Here are some suggestions. Of course I’m thinking positive, but there is the down side. And that is “more” loss of our privacy. Being unknowingly broadcasted live certainly will have its share of haters. I have already seen where people just set up their phone in a bar and start streaming. Part of me says tough luck, but part of me says you have the right to know. In general, I think this is a hot new item and will work its way into other apps. At the end of the day, this is a very cool concept. I suggest you take a look at this and see the potential it will have in the world. The Apple version works better than the Android, but its available on both. No worries – Chris is doing just fine with a new company. So what makes this symbol so special and why is everyone obsessed with it? Why are marketers hopping on the hashtag bandwagon? Lets look at how they work for marketers and then review some easy tips for planning. A hashtag is a pound sign (#), but it’s also used on Twitter to categorize messages. Marketers are using hashtags for all kinds of campaigns. The main reason is it is inexpensive and it becomes a unique identifier in a world of chaos on the web. Hashtags categorize your subject or topic you want searched on Twitter. If you want people to search for a digital event in New York you might put #DigitalEventNY or #DigitalNY. Hashtags can localize your campaigns by attracting people in a geographic area. Being unique with at #topic is critical for people to find your specific topic. Then they can have a conversation just on that topic. If the term is to broad like “Digital” see what the results result in. But if you add #DigitalmobileNY the results are different. You can see my result as I had tweeted earlier. Currently Oscar Meyer is running a campaign driven by Twitter hashtag campaign called #awakentobacon I wrote about this in a past blog and it is one of the funniest and creative campaigns. As a marketer, you want to be able to reach your community with the use of hashtags, especially during events, webinars or Twitter chats. When choosing a hashtag, it’s important to make sure that your hashtag is easy for users to remember. With thousands of hashtags roaming the social media universe, the last thing a business wants to do is create a hashtag that is hard to spell or pronounce. As you work toward using hashtags try to adopt it on multiple channels. Although the use of hashtags may have started on Twitter, they are now used across multiple social media channels including Facebook, Google+, LinkedIn and Pinterest. The worst thing that can happen when using a hashtag is to realize after it’s tweeted that the same hashtag is used for an entirely different topic.